I have been working on this book for quite a while now; even with a fair amount of skimming over detail, I am still 150 pages from the end. 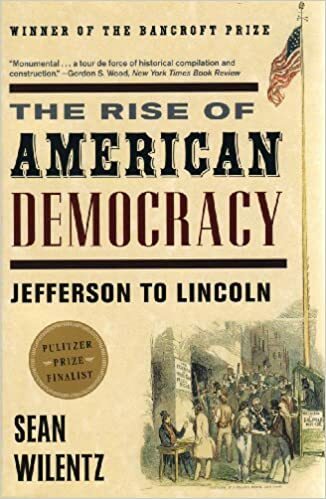 What is most remarkable about this account of the evolution of democratic ideas and institutions between the Revolution and the Civil War is the way it illustrates how unique American democracy is and has been. Any reader must certainly be disabused of any notion that the American way of doing things could possibly be exported. The American polity originated in its own specific environment quite unlike any other country's -- not much like Canada's -- and many of the issues that arose in the early republic have continued to be important since. Reading about the 1820s and 30s, for instance, there are echoes of the present as much as there are issues unique to the two times. The role of banks and big money in politics, for instance, or the conflict between secularism and evangelical Christianity for cultural influence. But to the point I raised above, about the uniqueness of American institutions. I think it applies to all countries. You have to build your democracy from the materials at hand. If the world ever becomes entirely democratic, there will not be one universal way of managing politics. Image above: Martin van Buren, one of many early American leaders whose importance has been entirely forgotten.